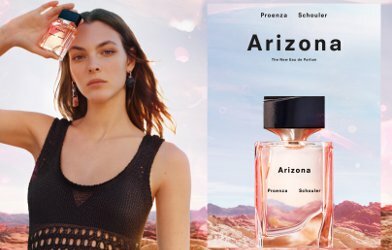 Proenza Schouler recently launched its debut fragrance, Arizona, a "radiant" scent that conjures "feelings of liberation to find a greater truth. . . a respect and love of nature, and a sense of unbridled freedom." Arizona was developed by perfumers Loc Dong and Carlos Benaïm and includes notes of white cactus flower, orange flower, orris, jasmine, solar accord, musk and cashmeran. Sounds good! I've never been to Arizona, but I do need to unplug more often, and fragrance is one of my favorite tools for reflection. So how does Arizona make me feel? Well, it opens with an accord of citrus and sheer vanilla that I'd call "artisanal creamsicle." That worried me a bit, since I didn't expect much sweetness. After about ten minutes, Arizona's heart is more of a salty amber with a hint of iodine and a few jasmine petals. The "mineral" notes that were mentioned in some press about this fragrance are subtle; there's a "hint of the metallic buzz that frequently accompanies iris," as Robin once described it. Arizona's base is a comfortable skin-scent of sandalwood and vanillic resin note. Arizona doesn't necessarily evoke the desert for me — it seems too smooth and cozy for that dramatic terrain. However, it's well-balanced and very wearable, even if it feels more like an autumn scent than a summer scent. It's not as "niche" as the Proenza Schouler guys have claimed, but as usual, that's no surprise. If you're a fan of Hermès Eau de Merveilles, you may like Arizona as a more carefree option. If you loved and miss Calvin Klein Reveal (as I do! ), you'll probably find Arizona very appealing. It has moderate sillage and good staying power: I applied Arizona at 9 in the morning, and I thought it had faded away by the afternoon, but apparently I was wrong. A co-worker noticed it at 3 pm, complimented it, and identified it something different than my usual office scent. One question I ask myself when a fashion brand launches a fragrance is, "How well does this perfume capture this brand's fashion style?" However, I'm a little stumped in this case. Other than being generally aware that Proenza Schouler is a cool-girl American brand, I don't know offhand how to describe Proenza Schouler the way I can describe Miu Miu or Alexander McQueen or even Tommy Hilfiger. When I read its name, I can only think of actor-comedian Drew Droege's "Chloé Sevigny" character (loosely inspired by the actress), who (like her real-life namesake) frequently name-drops Proenza Schouler. I know the real Chloé Sevigny is a longtime fan of Comme des Garçons Rose. Would she wear Arizona? Possibly. Is it a cool-girl fragrance? Maybe, if the cool girls finally lose interest in Le Labo Santal 33. I'm neither young enough nor cool enough to be a Proenza Schouler muse (like Chloé), but I'm enjoying my sample of Arizona and I'd recommend it for an easygoing mental vacation. Proenza Schouler Arizona is available as $100 for 50 ml ($100) and 90 ml ($130) Eau de Parfum. Matching body products are also available. I did test this a few days ago..and I wasn’t overwhelmed with joy or disappointed..just thought it was okay ???? It’s pleasant to be around and wear, but I won’t be buying it, simply because it didn’t wow me at all. I can see it be a good seller but I wonder why they try to sell it as niche I don’t think there’s any niche about it..but is there any fragrance that is particularly niche these days? ???? The flacon reminds me a bit about “Fidji” by Guy Laroche-I don’t know if it’s just me tho ???? I agree that it’s pleasant but not niche-feeling! Then again, what IS “niche” anymore…?! I’m wondering how it will do, given that PS isn’t as big a name as Prada, D&G, even something like Coach, etc. etc…. we shall see! I have a sample of Arizona from one of the GWPs. I considered including it in a freebie package but pulled it back at the last minute and I’m glad I did, just so I can try it. Right now, I am still wafting my Solstice Scents Estate Vetiver and it will swallow up Arizona! You are so elegant, and this seems so casual. Please tell us if this suits you! Hello, and ditto what Ede said! But didn’t you know, the cool girls HAVE gotten over Le Labo Santal 33! https://intothegloss.com/2018/05/le-labo-santal-33-dupe/ None of the Le Labo’s ever worked on me anyways. I got the Santal 33 as a candle 6 months ago. It was overpriced and no label on it. Which I though was a bit odd. Anyway I liked the candle, the scent is lovely but after a while I could barely smell it and it didn’t burn well. I have tried a few of the fragrances from Le Labo. I enjoyed them, but I don’t want to spend that amount of money on something that is way hyped for what it is. I love that opening sentence about having worn Santal “for many years.” It was launched in 2011. There are a few Santal knock-offs out there now… Commodity Book is another one! Goest is a really cool brand that I rarely see mentioned. They do seem like a good replacement for Le Labo, if you’re that kind of a “cool” person. I’m hardly cool, but I’ll check it out sometime. I still have yet to try Reveal but I see it every so often at my TJ Maxx. I’m always tempted to buy it unsniffed. This sounds better that it had to be, honestly. I’ll be glad to send you a decant of Reveal. I just got a bottle in the freebiemeet from madtowngirl. Email me – my username at gmail. Oh thank you! I’ll email you at a more reasonable hour. I really liked Reveal. I had a feeling that my extreme like for it was a bad sign for its ongoing sales numbers, lol… my taste isn’t mainstream. Also, it’s messaging seemed a little confused. First Beauty, then Reveal. I would say poor Calvin Klein but I never expected too much from them. Reveal sounded so nice but I never came across it on my mall runs. I blind bought a bottle of Arizona and thought it was a bit too sweet during the winter. But now that the temperature is above 80 degrees, I love it. It’s got a sparse/ hollow? feeling that cuts through it – I imagine that may be the mineral notes. Longevity is excellent, though it has low projection – I caught whiffs while working out 12 hours after application. Agree with all this! It’s sweeter than I expected, but do like the “solar” and “mineral” notes when they peep out gradually. I *love* Drew Droege’s Chloe Sevingy character! He is just so exceptionally funny. I am a lukewarm NYC woman with short legs, lol. But I do like it. That Chloe character never gets old for me. I have a hard time explaining why I find it so funny…either you get it or you don’t, I guess! I felt so ‘uncool’ reading this, such as hilarious blog post. Love it! Got given a sample of Arizona but found the opening too sweet to put me off the whole thing, despite an interesting dry down. I’m still on the look out for my perfect solar scent. oooh, did someone say Eau des Merveilles? That got my attention, I will look for this one when I am out and about.